This is a long-awaited second book in the Backyard Witch series, aimed at young girl readers, age 7 to 10. It can easily be a good first chapter children’s book, though it is a bit longer than your average first-chapter book. Again, we meet a friendly, funny witch, Ms. M, and she’s come at the right time to help Jess learn something about herself. In some ways, this children’s book is a like a companion for girls who are struggling to be themselves, rather than fit the mold their parents have made for them. It’s a stealth weapon for self-esteem and self-expression. The book walks a fine line between making the mom completely misguided, while allowing the young daughter to have some empathy and true caring for her mother. In the end, their relationship only improves as a result of the visit of Ms. M.
While I felt there was a little more humor in the first book, Sadie’s Story, I’m glad that this is available, because it has potential. I also think it’s good to give emerging readers a children’s book with more depth than the average first-chapter children’s book usually serves up. 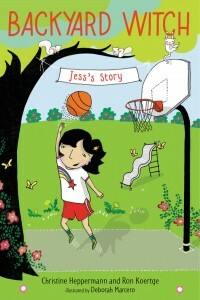 So while it’s not a 5-star book, it’s a good addition for a young girl reader.